On the drive from my BFF’s home to my apartment in West Chester, Pennsylvania, I come down Route 100 South to where it merges into Route 202 South. Just before the merge there is a chokepoint where the two lanes of Route 100 converge into one, and the lead up to this point is so long that vehicles often race one another to the first place position. This can get messy when traffic is heavy. There’s something about being behind the wheel of a vehicle that can bring out the worst in people. Part of it is anonymity – when you are driving you are unable to see the other drivers, to look them in the eye. It is the same phenomenon that turns people into jerks on the Internet. Part of it is the way being in a vehicle insulates you from the reality of your situation and the danger you are in. It can’t be worth all the energy and risk put into aggressive driving to save a few seconds or jockey for position, but people do it anyway, as though unaware that the real stakes are not their status but their very lives. This is all covered in a fascinating and illuminating book called Traffic: Why We Drive the Way We Do which I recommend to anybody. 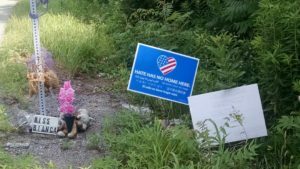 In July 2017 two vehicles met at the convergence point on Route 100 South and in the ensuing struggle to merge a tragedy unfolded. One of the drivers shot a handgun into the other driver’s car, killing her. The details of the case read like an awful convergence of today’s troubling social issues, an absurd outcome of our exaltation of individual rights, an ominous sign of the undercurrent of conflict beneath our civil society. Or it could just be the story of one person making a very poor choice. At the site of the shooting there is a roadside memorial. The choice of the sign – HATE HAS NO PLACE HERE – aligns the message in the current political environment. It’s as if to say: please stop killing us. There is some consolation, I suppose, in knowing that authorities have placed highway signs in honor of the victim. Just a few weeks ago, the perpetrator pleaded guilty in court to third-degree murder, and will receive his sentence by the beginning of next year.